From https://www.biloxi.ms.us/visitor-info/ – The official website of the City of Biloxi. 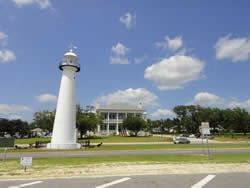 Biloxi is one of the oldest communities in the country, having first been settled in 1699. Today, the city is a cultural melting pot, with a year ’round schedule of celebrations, set against a backdrop of sugar-white sand beaches, great deep-sea or freshwater fishing, an array of championship golf courses, museums and historic sites, tantalizing seafood restaurants, and the excitement of 24-hour non-stop casino resorts. Of course, our strongest assets are the smiling faces and warm hospitality that await you. But don’t just take our word, see for yourself. Take a video tour of downtown Biloxi. Months after Hurricane Katrina, a five-minute whimsical video tour of Biloxi and south Mississippi was created, offering you a chance to meet some of our most colorful characters. To see the video, click here. For more information about what you can see or do on the Mississippi Gulf Coast, you can reach the Biloxi Visitors Center at 1-800-BILOXI-3 (1-800-245-6943), at visitor@biloxi.ms.us, or click on any of the links below. See a calendar of events, click here. For a ride on Coast Transit’s Casino Hopper shuttle, click here. Once you arrive, drop by the Biloxi Visitors Center, north of the Biloxi Lighthouse and west of Beau Rivage Resort & Casino, on U.S. 90. The $11 million center, which opened in July 2011, has a series of multi-media exhibits that tell the colorful history of Biloxi, and you can also find out the latest on what there is to see and do during your visit. For more on the visitors center, click here.